NEW ORLEANS — One year ago, the big debate over the Common Core standards in Louisiana centered on how to put them into practice. Now, the Core is on shakier ground. Political opposition is rising in the state and Gov. Bobby Jindal has distanced himself from the Core, raising the possibility that teachers may have to put the brakes on standards they’ve been working on for years. This week has not been easy. A Core dilemma: Will the littlest learners be able to type? Louisiana was an early supporter of the Common Core State Standards, which aim to promote critical thinking. The state’s schools are teaching to the standards now — and students will be tested as soon as December on how well they meet the new expectations. The Core, adopted by 45 states and the District of Columbia, was developed under the National Governors Association, partly in response to federal incentives for states to adopt standards in their schools that would ensure that students are ready for college and careers. In 2010, Louisiana’s Board of Elementary and Secondary Education voted to adopt the standards and then–Superintendent Paul Pastorek signed on to lead the development of a new set of tests, PARCC (Partnership for Assessment of Readiness for College and Careers), which Louisiana and 18 other states plus the District of Columbia will start using in 2014. Louisiana Catholic Archdiocese schools decided to use the standards too. While educators worked to figure out how to meet the new expectations, the political atmosphere remained relatively calm even as Tea Party–backed politicians challenged Common Core in other states. A resolution this spring by State Rep. A.G. Crowe, R-Slidell, which demanded the state withdraw from Common Core, drew hours of testimony but was firmly quashed in committee. But in August, as students returned to schools and teachers debuted new math and English lessons, Jindal evaded a question about his support in an address to the conservative RedState gathering. That set things off. This week State Rep. Cameron Henry, R-Metairie, pledged to file a bill to halt implementation and parents are speaking out across the state, including in Baton Rouge, Vermilion and St. Tammany. Longtime Common Core supporters such as state Senate Education Chair Conrad Appel, R-Metairie, Superintendent John White and members of the Board of Elementary and Secondary Education are attending community forums, looking to garner support. Jindal is now treading a political middle line. His spokesman Kyle Plotkin spoke delicately Monday, saying the governor did not support “a national or federalized curriculum,” a critique of the Core that has also been invoked by the Tea Party. But not only is there no federal curriculum, there isn’t even a Louisiana curriculum. Instead, the Common Core lays out overarching education principles and specific skills students should master in different grade levels. For instance, first graders should be able to describe a story’s characters, settings, and major events using key details. And the state Department of Education has taken a hands-off approach, putting the decisions about how to teach those principles and skills into districts’ hands — a choice that has itself been controversial among educators. States across the nation are facing the question of how to put these new standards into practice. Some have responded with a relatively centralized approach. New York, for instance, has created a set of state-sponsored curricula aligned with the Common Core (although districts do not have to use the new curricula). In Tennessee, the professional development is relatively consistent across schools and districts. But Louisiana is taking a more laissez-faire tack, giving school districts considerable latitude in how to implement the Core. White believes a hands-off approach empowers teachers and principals to be creative. Whether intentionally or not, it’s also politically shrewd given the current attacks on the Core in Louisiana charging that it represents federal and state encroachment on local affairs. Embracing the new curricular standards, but in a decentralized fashion, allows state officials to say they are honoring local autonomy and control. The state has provided schools with some common resources, including sample year-long plans, videos, and examples of the types of questions students will be tested on, and created a cohort of teacher-leaders to offer guidance to their peers. Some school leaders say they would have preferred the state provide more support and consistency with Common Core implementation, however. With no single mastermind calling the shots, Louisiana schools have tackled the Core in a variety of different ways. In Baton Rouge, Taylor plans to bring in experts to help design a new curriculum and coach teachers in how to teach it — even if that expertise comes at a significant cost. Taylor proposed hiring the University of Pittsburgh’s Institute for Learning for up to $2.7 million over four years. When some school board members protested that price tag, the district issued a request for proposals; Taylor hopes to hire an outside group by the end of the fall. “In the end, what I believe we need is technical assistance,” said Taylor. “This work is very multifaceted and I’m not sure if people understand the magnitude of the change.” He said the Pittsburgh-based group would provide comprehensive training in curriculum development, teaching strategies, and student assessment. The comparatively small and rural Plaquemines Parish School District has taken a different course. While the district has brought in numerous experts and speakers for professional development sessions, teachers have done the majority of the new curriculum development on their own. The district provided stipends for teachers to come in at various points over their summer breaks, which most teachers took full advantage of. On one July morning, dozens of teachers worked virtually nonstop in the district’s central office, scarcely looking up when someone announced lunch break. The teachers brainstormed lesson plans and conferred on PARCC. For veteran educators like Mary Beth Newchurch, who teaches fourth grade at Belle Chasse Primary, the Common Core validates the autonomy she has always exercised in her classroom. “I think it does give us teachers more leeway,” she said. Ritz is proud of how energetically her teachers have studied the Core and adjusted their lesson plans. She worries, however, that interpreting standards — and then translating them into effective curriculum and classroom instruction — will come far more easily to some teachers than others. Various nonprofits and education support organizations have jumped in as well to support charter schools, which don’t have the same district-level resources to draw upon. Both the funding group New Schools for New Orleans and the Eastbank Collaborative of charters have created Common Core cohorts for teachers and administrators. Several districts and charter schools have taken a middle-of-the-road approach: developing or purchasing a Common Core-aligned curriculum teachers can use as a resource at little to no cost. In St. Tammany, educators worked in-house to revise the district’s existing online curriculum to match the Core standards, said Assistant Superintendent Cheryl Arabie. The Common Core stresses that students should be able to pull specific examples from texts when writing about them, for instance. So an old writing prompt in St. Tammany’s online curriculum read: Write a report on Amelia Earhart. What did you like or dislike about the Biography of Amelia Earhart and why? By contrast, the new prompt reads: After reading three texts describing Amelia Earhart’s bravery, write an essay that analyzes the strength of the arguments about her bravery in at least two of the texts. Remember to use textual evidence to support your ideas. Arabie said the curriculum is not “scripted” in that teachers should elaborate or diverge from it based on their students’ needs. “We don’t say, ‘Monday at this time you have to do A, B, C and D,’ ” she said. 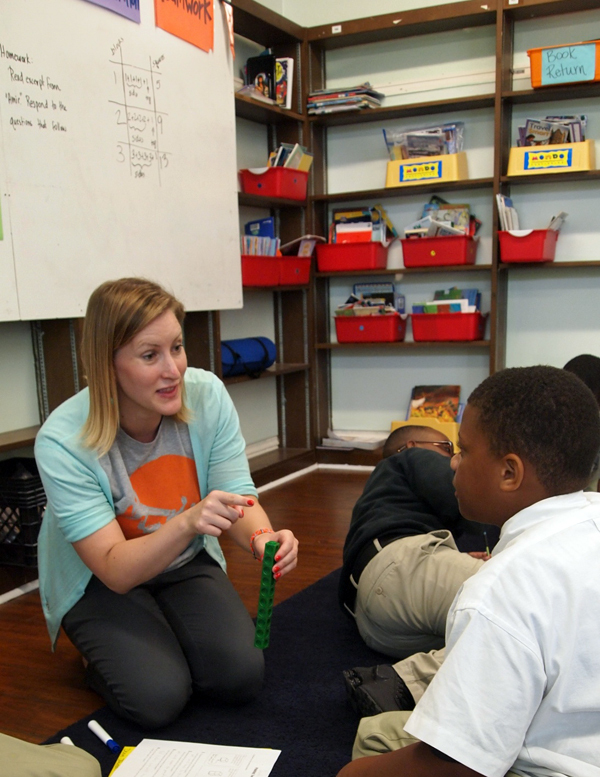 FirstLine, a charter network that operates five schools in New Orleans, has also provided its teachers with math curriculum materials in sync with the Common Core. In FirstLine’s case, the curriculum was created by an outside organization, a nonprofit contracted by the New York State Education Department as part of an effort known as EngageNY. Kirsten Feil, the director of academic support, said FirstLine opted to use the materials, which are free, because national experts steeped in the new standards helped review the units. “We don’t have the resources in house to do that,” she said. Regardless of whether they are called on to be curriculum developers or not, Common Core will put Louisiana’s teachers to the test. 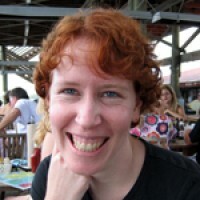 Anderson plans to rely on a blend of EngageNY and strategies and lessons culled from her own experience and online exploration. When teaching her fifth-graders about place value, for instance, she will use elements from a Common Core preparation program called LearnZillion and a game-based instructional software program called ST Math, among other resources. 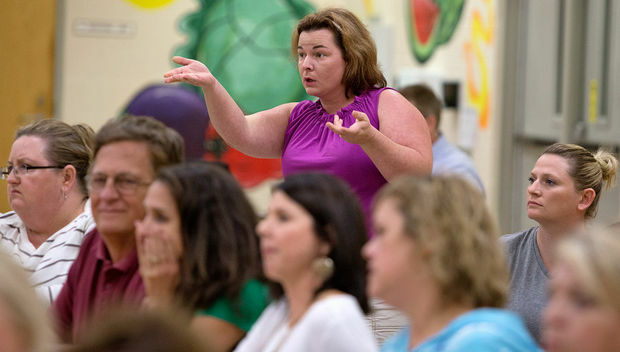 Anderson said she has enjoyed the research, but thinks the shift to Common Core could be more challenging for first-year teachers and for teachers who aren’t as accustomed to using online tools. “These mathematical leaders did a ton of work to create standards, but they didn’t actually create users’ guides,” she said. With a thousand Common Core flowers blooming, teachers can hit the occasional thorn. Vermilion Parish made national headlines this month when a parent took offense to language in afourth-grade worksheet, created from a Common Core website, that referred to the song “Po Pimp” and the band Speedknot Mobstaz. Superintendent Puyau apologized and said the district had pulled everything from that website, which legal counsel told him not to identify. Vermilion is using EngageNY for math, and blending that curriculum with other resources for English. Administrators are now reading “every word” of the materials before they go into the classroom, Puyau said. By late August, EngageNY had released unit and lesson plans in math for the first half of the school year, but teachers still awaited the second half, which likely won’t arrive for several weeks. He also blamed the speed of implementation for some of the stumbles his district experienced putting together materials. Karen Richardson, a Vermilion elementary teacher with 24 years of experience, identified a different problem for her students: a lack of time allotted to help students with the transition from Louisiana’s previous grade-level expectations. “The problem is it’s not where they left off” in the spring, Richardson said. Some concepts were not taught or not fully taught in the lower grades. For instance, fourth-grade Common Core math assumes that students have memorized their multiplication tables. “You can’t teach multiplication by 10 if they don’t know how to multiply,” she said. She doesn’t know what the end-of-year tests will look like. And with EngageNY incomplete, she doesn’t know what she’ll be teaching in the spring. Parents are confused by new math terminology. 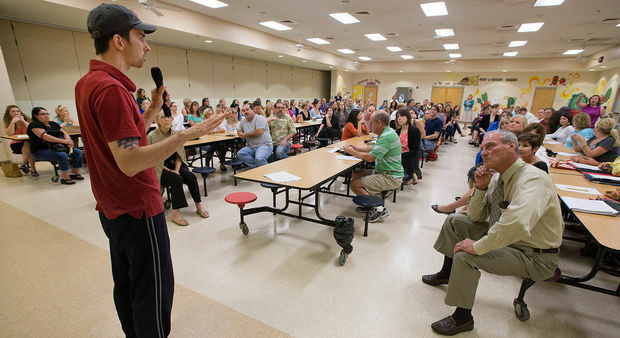 For some teachers, the concerns have dissipated as they’ve had more exposure to the standards. In April, Ronicka Harrison Briscoe from New Orleans’ Andrew Wilson charter elementary school told NBC News she didn’t have enough support from the state to implement the standards – even though she was participating in the teacher-leader program. But since then, she’s found more guidance, both through the Common Core cohorts convened by New Schools for New Orleans and the Eastbank Charter Collaborative, and from the Louisiana Department of Education. Though she still could use more time, the state has “attempted to provide more guidance around planning and instruction,” Harrison Briscoe said. While politicians can call for the state to pull out of Common Core, it’s not so simple for schools. Superintendent White said his phone had been ringing off the hook this week with distressed teachers and superintendents wondering what they’re supposed to do. The Louisiana Common Core–aligned tests are nearly complete, White said; next week, the state Department of Education will release hundreds of sample questions. East Baton Rouge Parish School Board member Craig Freeman hoped there would be no changes in his district. He went to a Common Core parent meeting at his daughter’s school this week. Parents had questions, but all the teachers were excited, he said. FirstLine is going full steam ahead: all levels of the organization are committed to Common Core, an administrator said. In Vermilion Parish, Puyau is having a more difficult time. The “Po Pimp” episode hasn’t been the end of families furiously objecting to the content of assignments. A parent lambasted the Common Core for an assignment in her child’s social studies class – not knowing the state is still using its own standards for that subject. To dampen the flames, Puyau has cleared his schedule for the coming week to meet with parents and is trying to create more support for families. For instance, math teachers are creating videos showing how to solve Common Core problems so parents can help children with their homework. Lauren McGaughy contributed reporting to this story.